Hypertension, or high blood pressure, accounts for more than 23,000 deaths in the United States annually, and affects one in three non-institutionalized Americans in 2010, according to the Centers for Disease Control and Prevention. The ability to properly regulate blood pressure and prevent hypertension depends on several factors: intrinsic factors, such as genetics, as well as external factors like diet. Consuming Himalayan rock salt -- a type of sea salt that can range in color from pink to grey -- can affect your blood pressure, and lead to health problems in those vulnerable to hypertension. Himalayan rock salt contains a number of minerals, present in varying amounts. Almost all of each crystal of Himalayan rock salt is made of of sodium and chloride -- the two minerals that also make up refined table salt. Together, sodium and chloride account for the taste of the salt. 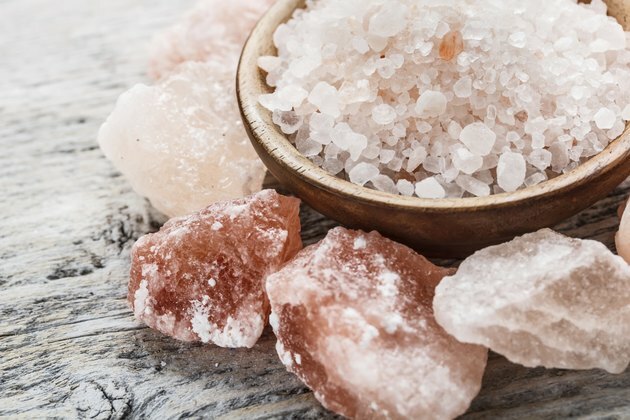 Himalayan rock salt may also contain trace amounts of other minerals, including magnesium and calcium, that contribute to the distinct appearance of the salt. However, these trace minerals are present at such low amounts that they do not typically have a significant effect on your body. Himalayan rock salt has an effect on blood pressure and hypertension because of its sodium content. One role of sodium is to help regulate the fluid levels in your body. When you consume sodium, your body retains water to help maintain your blood's electrolyte balance. In some individuals, this fluid retention can result in an increase in blood pressure levels. Consuming salt can also affect your hormone balance, and signal for your adrenal gland to release ouabain, a hormone that contributes to hypertension, according to the University of Maryland Medical Center. As a result, if you consume large amounts of Himalayan rock salt -- or other types of salt -- you may increase your risk of developing the disease. Monitoring your Himalayan rock salt intake can prove important to your health, since salt-associated hypertension can lead to a number of health problems. Individuals suffering from hypertension might suffer from headaches due to high blood pressure, though in many cases patients do not notice symptoms until their hypertension causes tissue damage. High blood pressure can damage the kidneys, heart and blood vessels, potentially causing heart attack or stroke, according to MedlinePlus. Limiting your consumption of Himalayan rock salt, as well as other types of salt, may help lower blood pressure or reduce your risk of hypertension. When tracking your salt intake, you must take into account both the salt you add to your meals, as well as the sodium already present within the food. To help reduce your overall salt intake, avoid pre-packaged or fast foods. Instead, opt for fresh foods, like fruits and vegetables. You can season your meals with small amounts of flavorful Himalayan rock salt, if allowed by your doctor. In general, you should limit your sodium intake to 1,500 mg daily, according to the Linus Pauling Institute. However, if you already suffer from hypertension, talk to your doctor to determine an appropriate sodium intake level for you, and to discuss the safety of consuming Himalayan rock salt.